So many times, I am searching for ways to supplement my math curriculum with extra activities and opportunities for practice! These booklets are designed to save you time as a teacher and to help you be flexible with your teaching! They have been a life saver some weeks! ~You choose how many pages you complete each day. ~You choose how you complete the activities... whole group, small group, independent work or in stations. ~Save paper by copying these half pages front to back. ~Forget multiple sheets of paper and copying every day... just copy once and you have activities for a week (or more!). 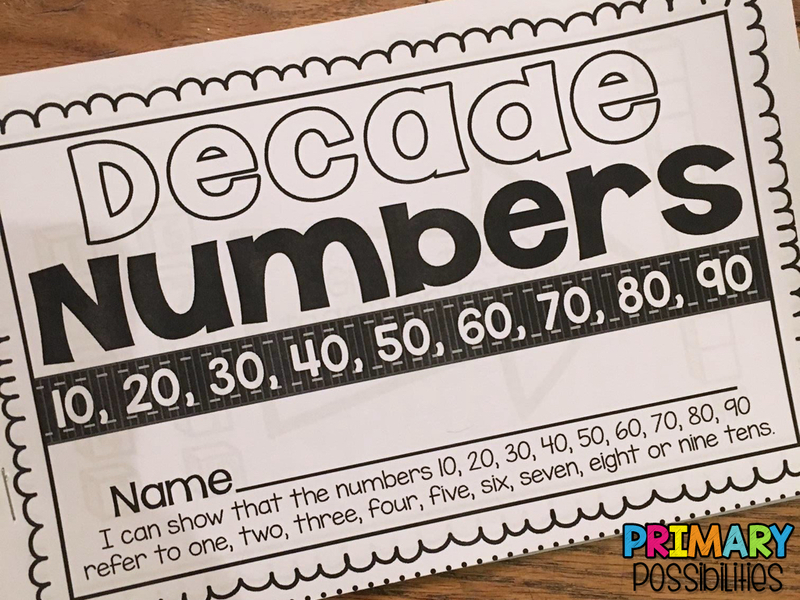 ~Quickly check student progress by flipping through the booklet. ~Different types of activities to engage different types of learners! ~When your class has completed the booklet you can send it home to show parents what you have been working on. 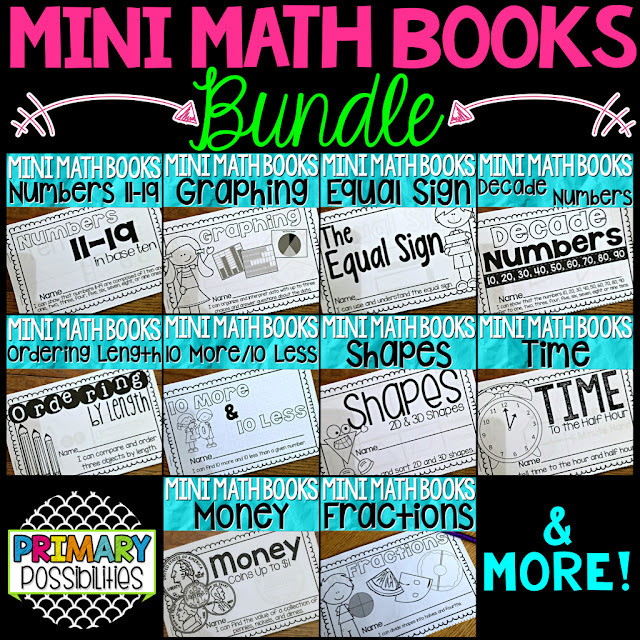 Plus, you don’t have to place multiple copies in mailboxes... just one booklet per student! There are many books to choose from! Or you can grab up the bundle! 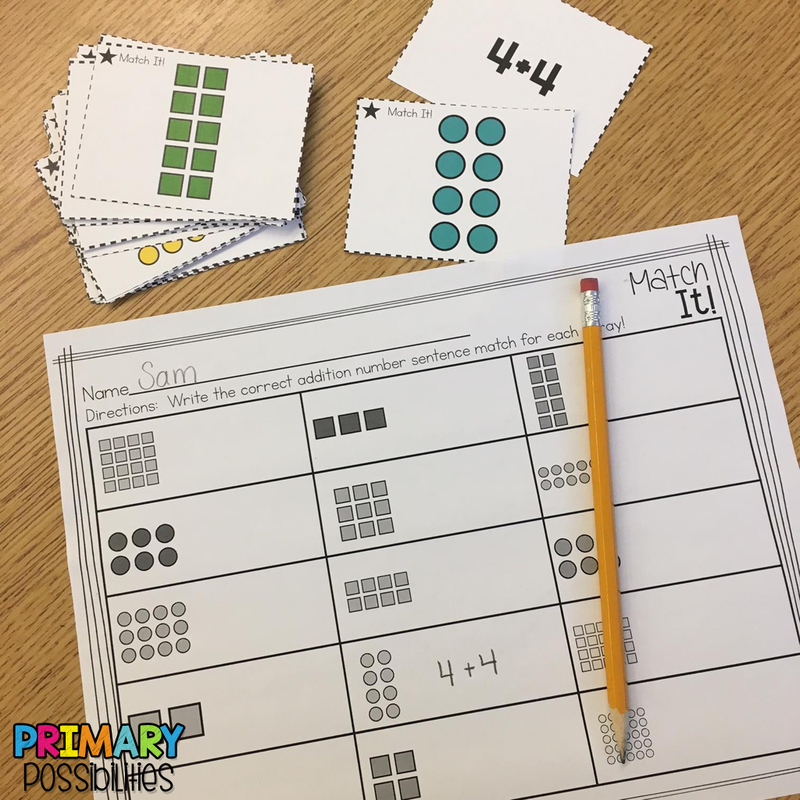 Arrays are the beginning step to understanding the concept of multiplication. Most second grade teacher introduce them to the whole class towards the end of the year. 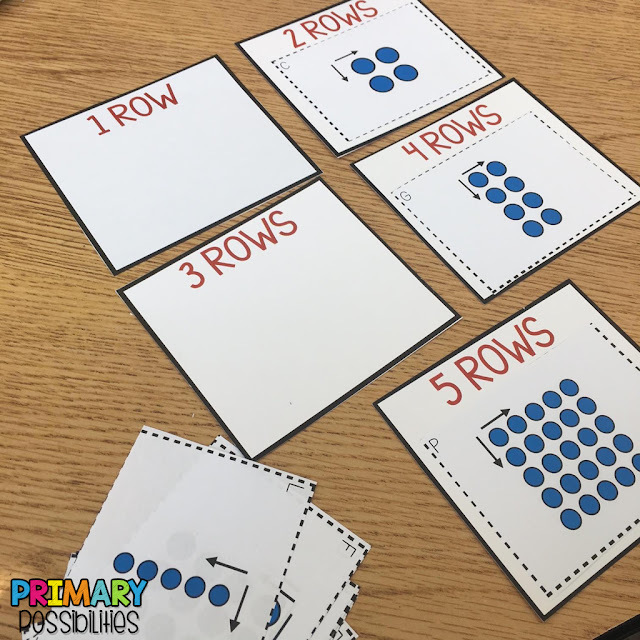 I always want to make sure my students have a firm grip on the concept of arrays before I mix in multiplication! I have found that kiddos kind of "lock up" when you throw the word multiplication at them. When they naturally start to see it with arrays, they are more comfortable and excited to start venturing into multiplication! This is a great You Tube video for showing kids arrays in their environment. My students always love finding and pointing out arrays around the building after we watch this video! 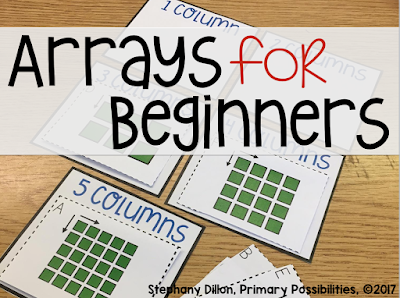 You can use all kinds of odds and ends from your classroom to create arrays with your students. 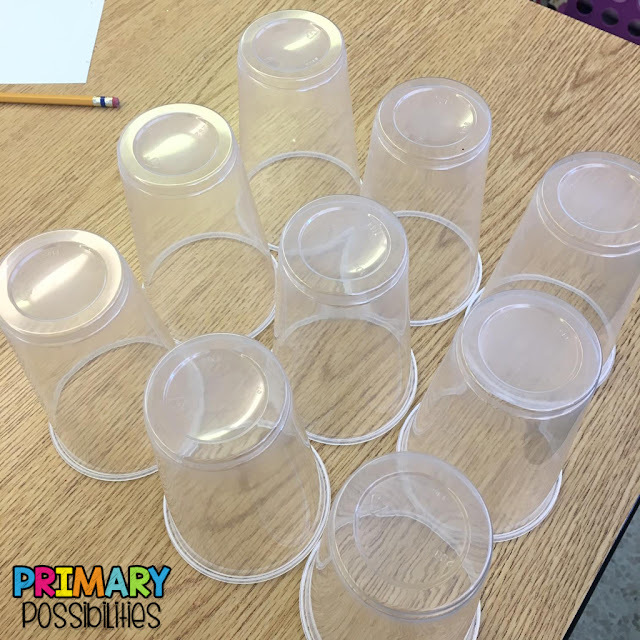 Here are a few of the things we use to create arrays. No need to run out and buy anything, just create with what you already have jammed in your craft closet! 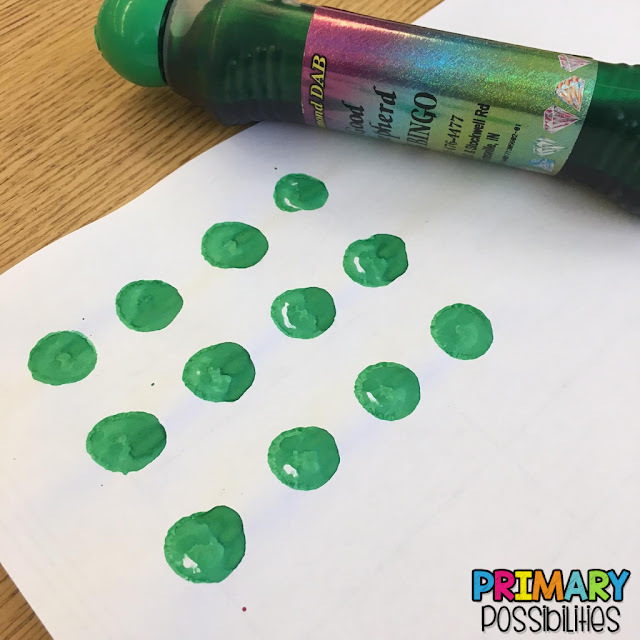 We use bingo daubers to create arrays on scrap pieces on paper. 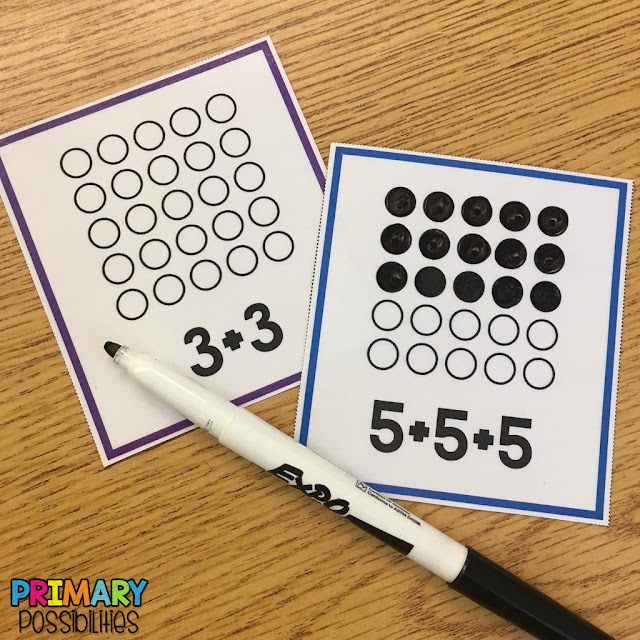 Small cheap stickers are a great way to motivate kiddos to create arrays. 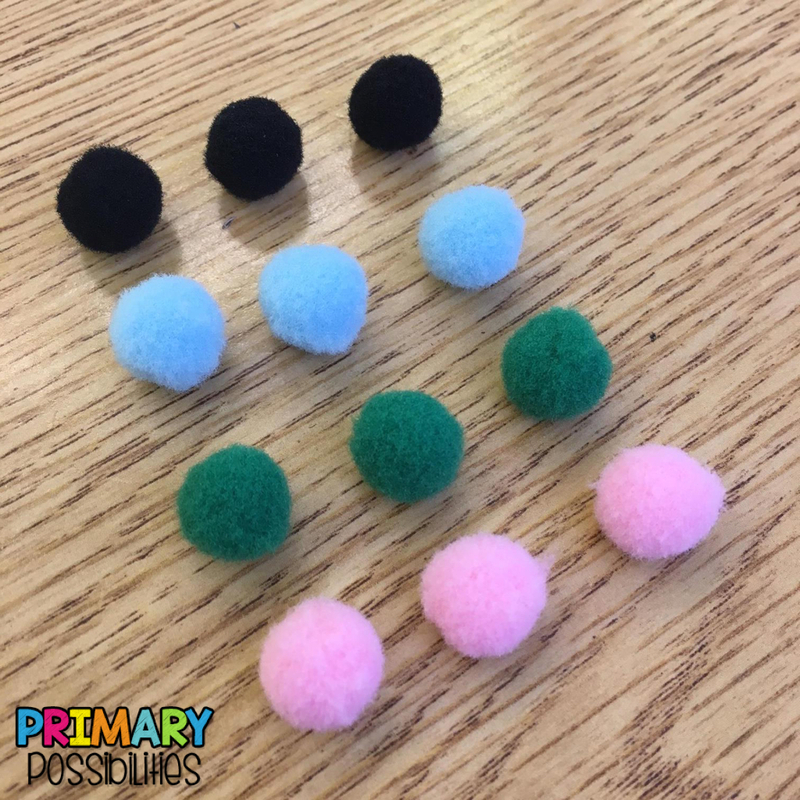 Pom Poms are a great way to create arrays. You can even use muffin tins to keep them lined up! I always seem to have extra cups from parties. 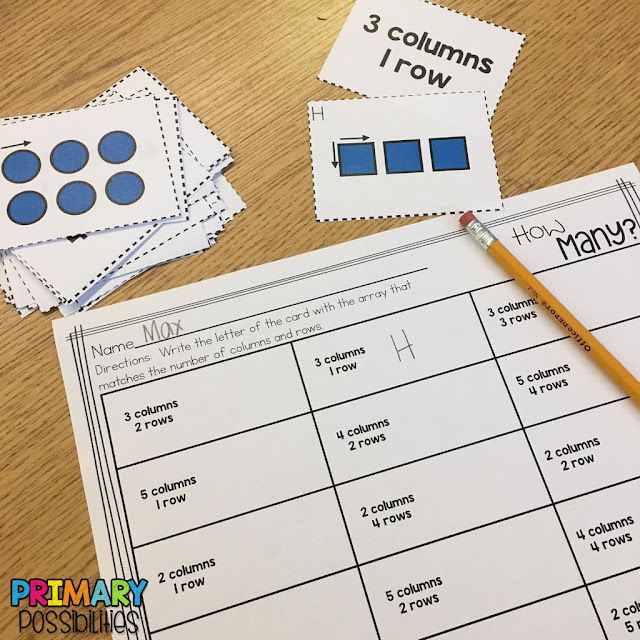 They are a great tool for making arrays. I created a packet for students who are beginning to use arrays. 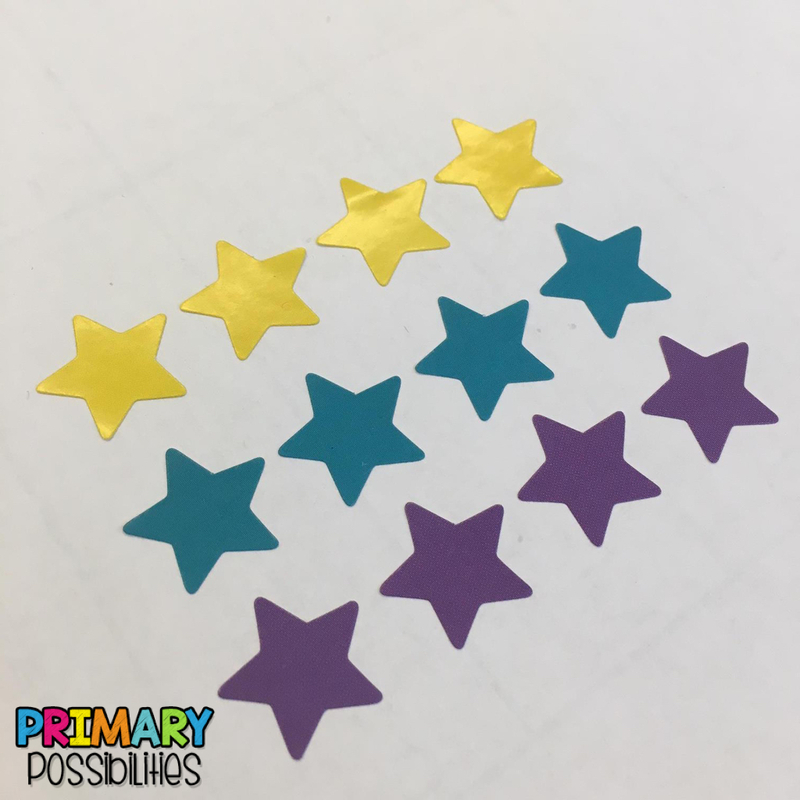 Here are some of the easy to prep activities included in the packet! 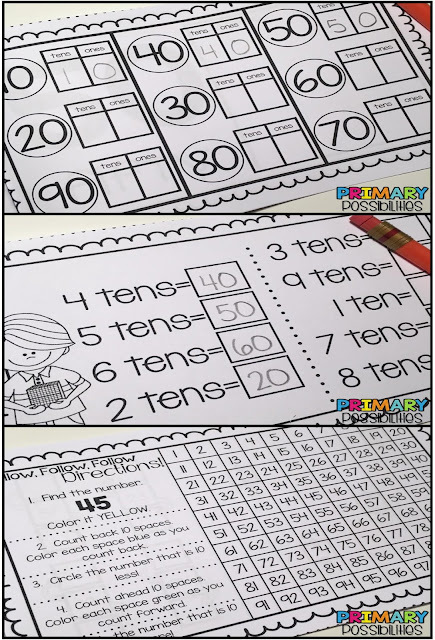 Students match the array to the addition sentence and then record the answers on the sheet. 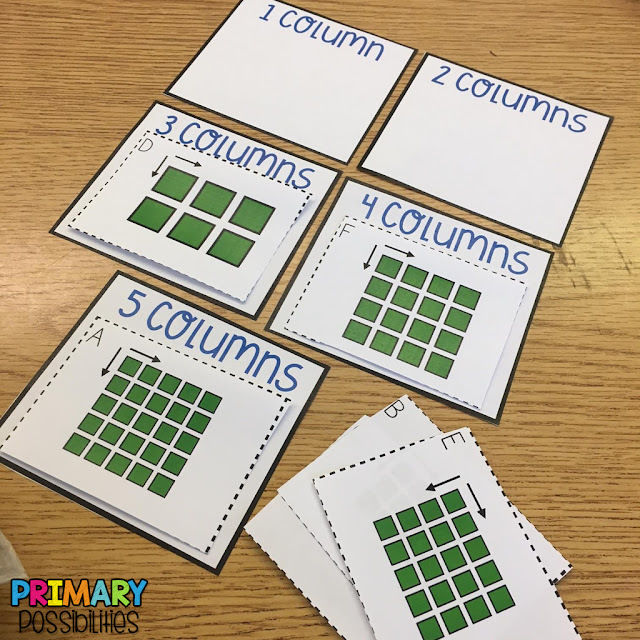 Students match the numbers of rows and columns to the card that shows that array. Students use dry erase markers on laminated cards to make the addition sentence. Students sort the arrays onto the column sorting mats. This includes a recording sheet to check for mastery! 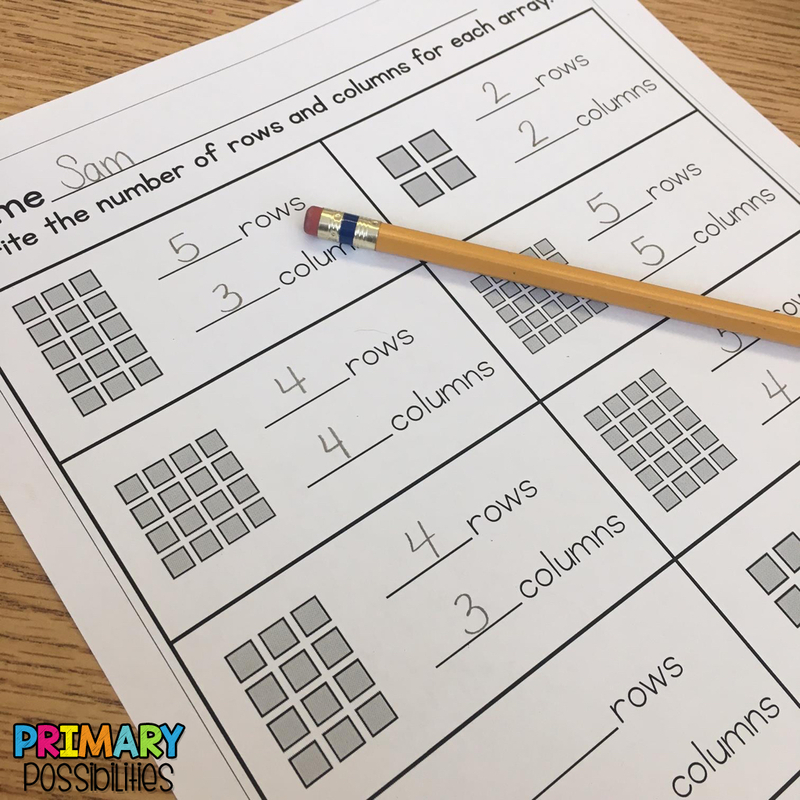 Students sort the arrays onto the row sorting mats. This includes a recording sheet to check for mastery! 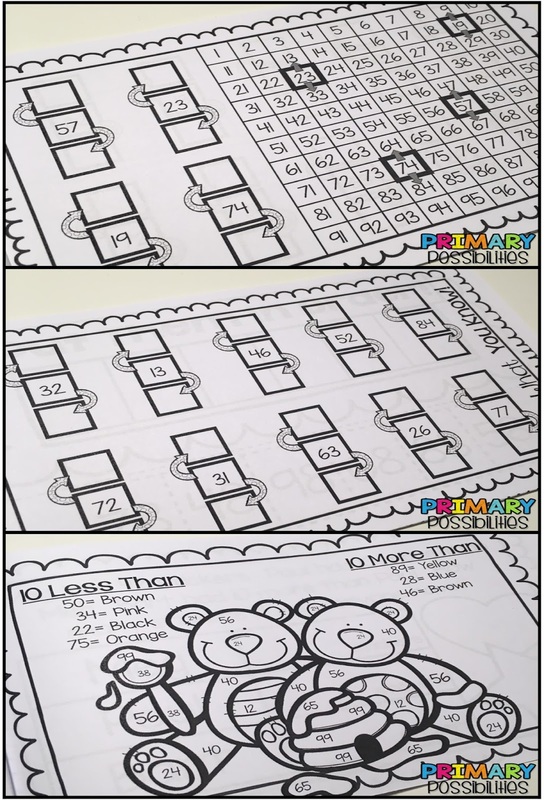 8 array worksheets are included that can be used for assessments, morning work, or homework! 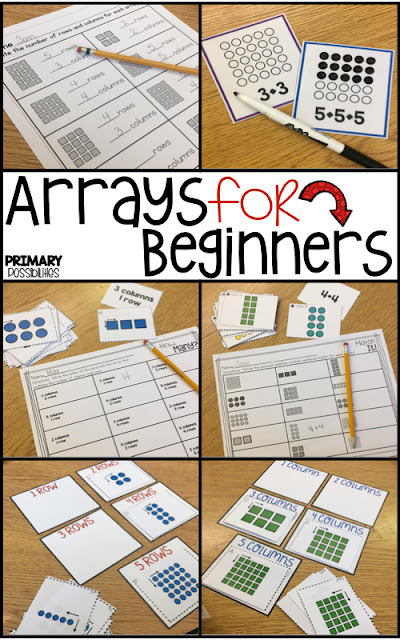 You can grab up this array packet in my TpT store by clicking the image below!